My sister has found some real gems recently. 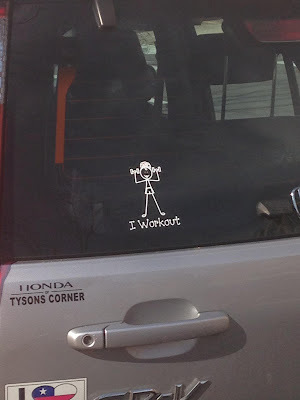 Here we have the uneccesary "I Workout" decal sticker. It's like the 13.1 and 26.2 stickers runners put up, but way more general and brazen. I feel like if you put that on your car you have to have an amazing body. Otherwise people will see you, see the sticker, and be like, "Maybe you should stop wasting your time." Either way, this person clearly has a spacing issue. I mean, move that sticker 4 inches to the left for the love of balance!